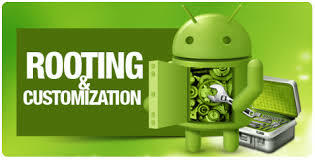 If rooting your Android device sounds fun to you then should also be reminded here that there is a possibility of voiding your warranty or even causing your Android device to be bricked just by rooting your Android device. If you would read every step in this article and follow it carefully, you would have minimized the risk involved in rooting your Android phone. Now before we get started in learning how to root our Android device, let us start by learning what rooting means. Rooting means full administrative rights. Just like you have full access to your windows computer as an Administrator; it is the same right you would have on your Android device when you root it. You won’t be limited to any restrictions that you carrier applied with root access. You would be able to customize your device to a greater degree and speed it up in different ways. By rooting your Android device, you would have to back up your software and flash it to a new custom ROM (modified version of Android). For technology lovers who likes to explore mobile phones to the fullest or enjoys risk taking, you would want to root your phone. Also, there are some apps that require root access you can easily authorize these apps that requires root access on your Android phone with the help of SUPER USER. Other benefit of rooting your Android devices is for you to enjoy free or cheap browsing. Some apps like Droidvpn among others would allow you browse at a lower cost on your Android device. Risk Involved in rooting your Android device. In every advantage there are disadvantages. Some reasons you wouldn’t want to root your Android device. – Phone bricking. You run at a risk of bricking your phone whenever you make changes to your phone. Hence it is imperative for you to follow the rules carefully when rooting your phones to avoid risk of bricking your phone. – Void warranty: Rooting your phone voids the warranty that comes with your Android device so have this at the back of your mind. You should do some reading before you try to root your device. XDA Developers Forum is the best place to find discussions about how to root your phones and custom ROMs. They also have an Android App you can download from Google PlayStore. It is important that you should back up everything including your current ROM before you start rooting your Android device. Please note I won’t be held responsible if your phone gets bricked in the process of rooting your device. 1. Turn on USB debugging on (to turn on USB debugging, Go To >Menu > Settings> Developer Options > USB debugging then check the box next to USB debugging and Allow Mock Locations. 4. Download Poot and install it. 7. If it fails restart by removing your battery and replacing it. 8. If your phone was successfully rooted, you would see 3 buttons. Select the button to download and install super user. A shortcut of poot in your desktop would make it easier for you to click it. 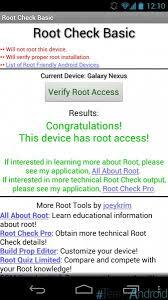 You can verify you the status of your rooted device by using root checker. What is your experience in trying to root your Android? Share your experience and thoughts by posting a comment on the box below. Thanks Donald, I really appreciate.